The head is the best part. 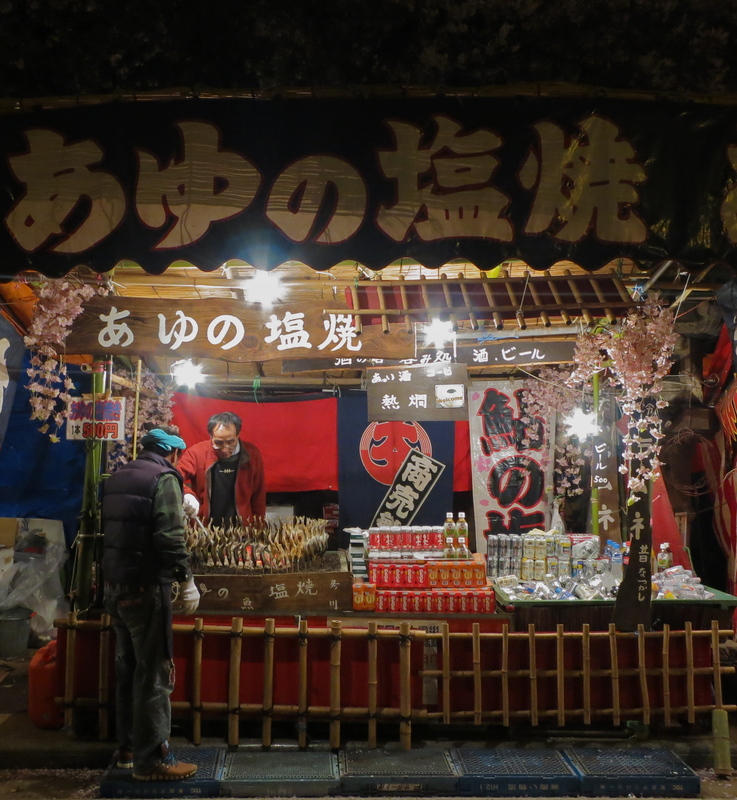 Or so I was told by the ayu vendor at the Yasukuni shrine. My new pet fish-on-a-stick looked too big to be eaten whole, but apparently that’s exactly what you’re supposed to do. Head, tail, innards, bones, everything. My main grill man helpfully informed me that they’re skewered upside-down so as they cook, all the fatty juices run down into the brainy bits, and the head ends up tasting “just like fried chicken.” Um, yeah. I think I’ve heard that one before. But it was too late. I’d already bought it. 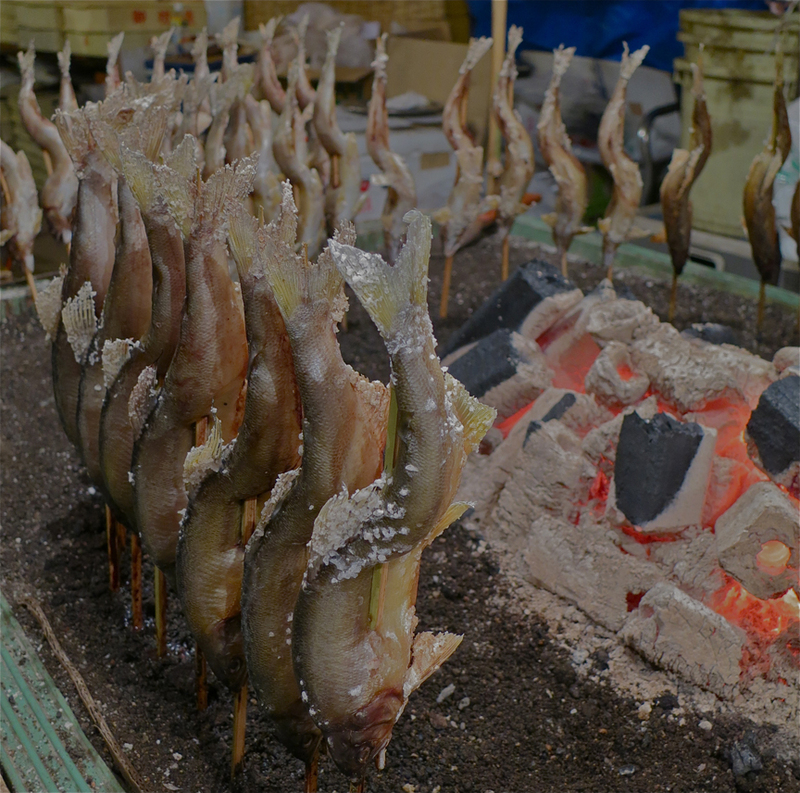 The first bite (the tail) was all crispy and salty and tasted just like my favorite izakaya snack, fishbone crackers. The second, third and fourth bites were sublime. Imagine the best-tasting fish you’ve ever eaten, slow grilled over a charcoal fire until crisp on the outside and tender & juicy inside. After the fourth bite I had to stop looking at my fish, though, because I knew I was getting into squick territory. Bite five was okay, although I had a little trouble banishing the diagram from my tenth grade biology dissection textbook. When I went for Bite Six, though, I discovered I’d accidentally stripped all the juicy bits off in Bites Four & Five, so it was going to be All Spine, All The Time. Ulp. Close eyes. Crunch, crunch. Done. Resistance is futile. You will be assimilated. We will add your biological distinctiveness to our own. Only the head was left. First, I procrastinated by positioning it predatorily over my beer can and snapping a few pictures. 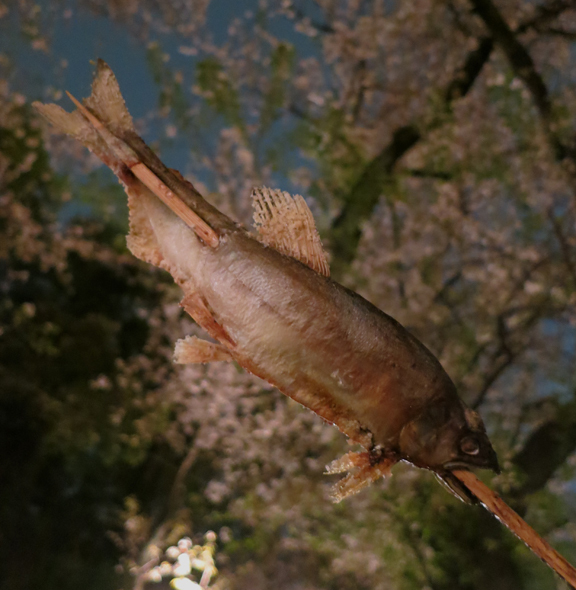 Then I let it swim around overhead for a few laps, so it could get a good view of the cherry blossoms. I squinted one eye and made it look like it was biting the moon. And then I ate it. I regret to report that it did not taste like fried chicken. It tasted like fish skull and fish brain and fish eyes. But I managed to get it down without entertaining any of my neighbors with a dramatic example of something else foreigners famously can’t do. Afterwards I sat under the glowing cherry trees on that chilly spring evening with an ayu in my stomach and a can of Kirin in my hand, and…you know those moments when you’re suddenly so happy to be alive? Well, that was one of them. 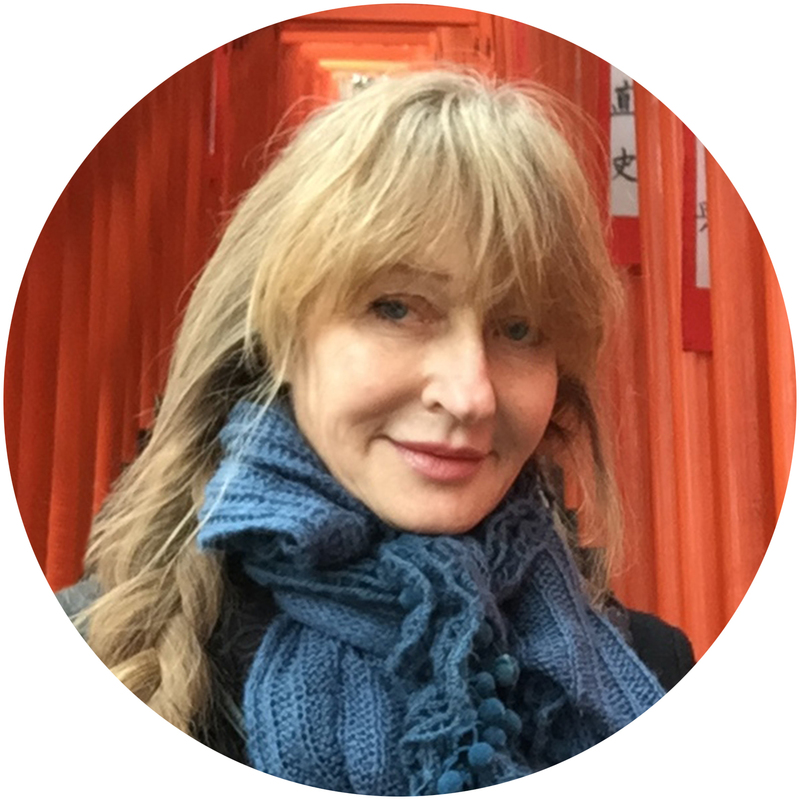 If you’d like to visit the Yasukuni Shrine the next time you’re in Tokyo, a map is on my website, The Tokyo Guide I Wish I’d Had. And you’re the greatest blog reader of all time, to say such a nice thing.